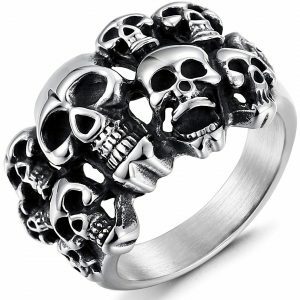 10 Skull Rings for Men! Bold, classy, and gorgeous are three words that define all men want in a fashion accessory. And for their fingers, there is no exception to that rule. It just needs to be something that would inject that dose of masculinity into their overall outlook. Well, we went hunting for something that has this description and guess what we found? Yes, you are correct, skull rings. These rings have the image of the skull either infused with the metal crafting or painted ion the front of the ring band. 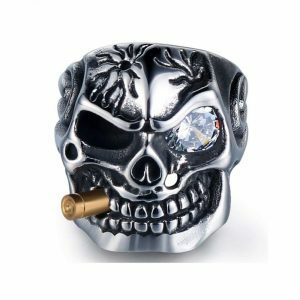 The design of this ring category is quite sophisticated, and you wouldn’t mind having the skull sign boldly glowing on your finger. 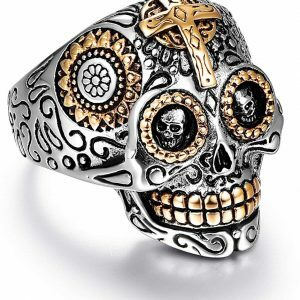 If you are all for the bravado and intense look that would keep the ladies on their toes and keep their eyes on you, then go for skull rings. Different myths have surrounded the skull for ages, and we wrote some of them and why you shouldn’t allow them to stop you from getting into this trend. We decided to kick off with one of the best skull rings we found. It came with not just one skull, but several of them arranged in a gorgeous pattern all-round the band. The build is comfortable for anyone who wears it and the skull there would provoke sheer boldness to face everyday life in you. With so many amazing features, it’s difficult not to recommend this piece to ‘king’ on your fingers. The piece was crafted with stainless steel of the highest quality that is not only durable but also harmless to the body. Each piece of skull is embedded into the band randomly with variations in the design. You can use it for any occasion and gothic style, and you certainly want to get one. FIBO steel has all kinds of high-quality stainless steel for an affordable price. The product was finished with high-quality polishing, and it has lasting color retention. Additionally, there is a beautiful pouch that the rings come in and it makes it a perfect item to gives out a gift for any season. 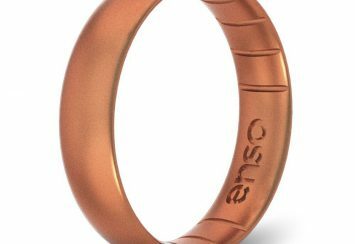 Other Info: The ring has a size of 8-14, and it comes with a 90-day product exchange or money back guarantee. The skull is for only those that are brave and resilient, and this is what this ring stands for. With a bold skull crafted atop the band, Fansing made sure that the fashion statement is loud and clear. The materials used are top quality, and with the expert’s hands that shaped the ring, it’s easy to tell that this is a piece that will dominate your fingers for quite a while. Carving a skull shape into strong materials like stainless steel is an intricate process, and this product gets it just right. 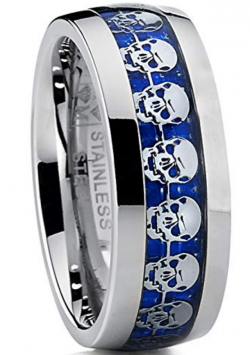 The band is carved with 925 sterling silver stainless steel with the full face of the skull boldly in the front. The width is just right to cover your fingers without creating any unnecessary discomfort. You can count on Fansing not to add any materials that would be harmful to your skin. 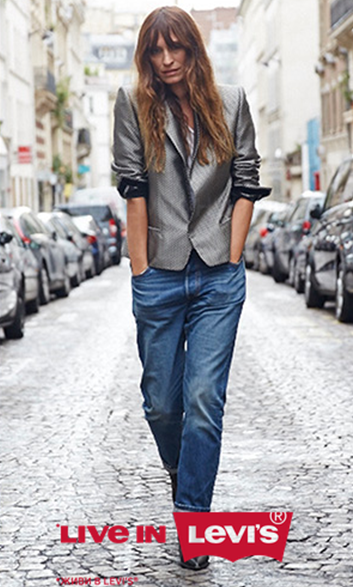 Throw this piece together with a flannel shirt and chinos, and you would get all the attention. While checking for this product, we saw a lot of positive feedback from customers which is why we can say you will love this one. It’s also very affordable for a great price. Other Info: Measure your finger before clicking the link to order to avoid ordering for one. From bracelet to watches and even necklace, HanTian has committed to making sure that men have the highest quality of jewelry possible. This ring is one of their products, and they infused it with top-notch components that are common to their brand. This piece carries the skull insignia and brings out the man in you when you wear it. Men jewelry is always characterized by being strong and masculine in appearance, and that is precisely why we recommend HanTian. You can use it for any occasion and be sure that it would blend in perfectly. The ring itself is crafted with hypoallergenic stainless steel which is resistant to rust or wears. It has fantastic features like an artificial crystal stone in one eye with a golden steel bullet between its teeth. 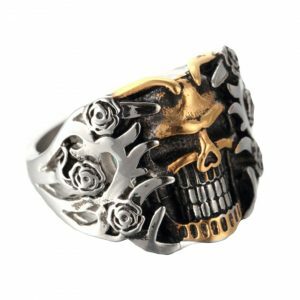 For all rock music lover, this retro skull ring is not only refreshing; it also makes people see you as the tough person you are. It is one of the best jewelry that you can get for the price range. Just check it out, and you would find yourself ordering one. Other Info: The ring comes in size ranging for 8 to 13. If you love symbols and vintage artifacts, then you want a piece like this. It has the skull and many other signs all drawn to complement the theme ‘day of the dead’. There are signs arranged all over the face of the skull making its theme rich in a gothic statement. It is perfect as gift items for your loved one who just got a bike or loves eerie but fashionable symbols. When it comes to stainless steel, 316L stainless steel has the best life span and quality. It is called surgical grade because it is perfectly safe in and out of the human body. And this is what is used to craft the band. The front of the band has the skull carved with a cross on its forehead and two other skulls created into the eyes. You would also love the aesthetic appeal that comes with the golden teeth and Celt design drawn all over it. Together, the ring is one big rock style jewelry that is comfortable to wear. For anniversary, congratulations, or graduation, you can use this as a gift to your loved one. It is utterly masculine and would bring whoever wears it happiness, joy, and fashion. Check out the picture, and you would love to have one on your fingers. Other Info: The ring comes in an antique color and has a different band size. 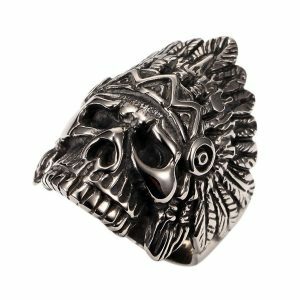 With a vintage feel and classic design, Pauro Dayak Headdress Punk skull is one ring that has all the perks you need in a skull piece. It has a black matte finish that makes it look unique, and its excellent quality is not up for debate. You can get yourself one or wrap it up in a gift bag and send it to your loved one. With a band of 316L stainless steel, it has a base that would last for a very long time. The headdress of the Dayak Indian was carved into the top of the band with the full skull under it. 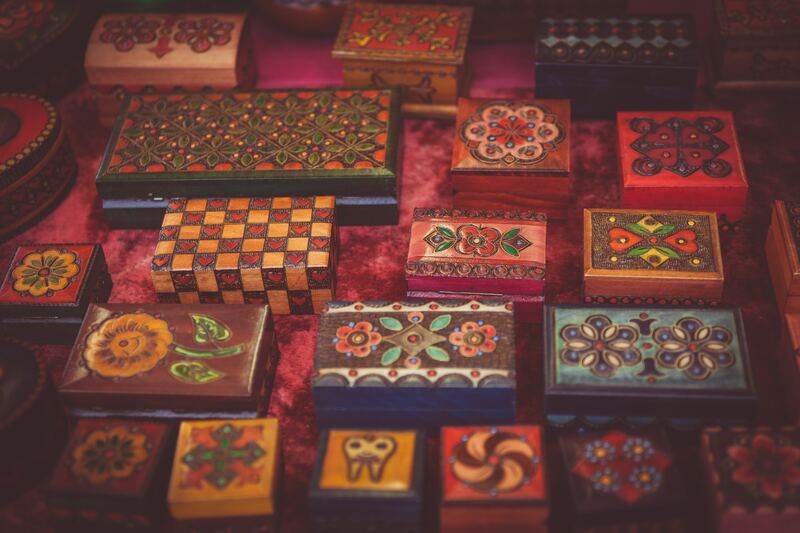 It is one whole package that represents the afterlife along with a rich cultural insignia. You will enjoy the comfortable feel that is measured at 1.2 inches to 1.4 inches. The color looks like black steel with a finesse that is alluring. You get the item with a black velvet pouch that can help you keep it when it’s not on your fingers. There aren’t a lot of product that combines culture, fashion and symbolism perfectly. So get yours, and you won’t be regretting very soon. Other Info: The ring size ranges from 7 to 13. We have fantastic products for you on Jewelry Jealousy that would bring your outfit to life and suit you quite well. 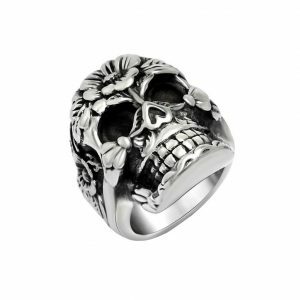 From Menso, this skull ring comes with a high-quality mixture of fantastic material to create an intense look. 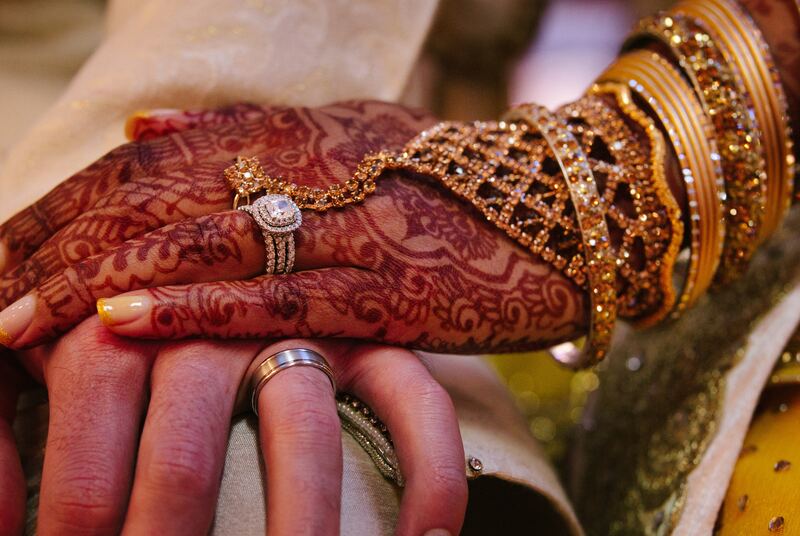 With the primary goal being your satisfaction, you can trust that this ring would not disappoint. From our other five options, high-quality stainless steel is one of the most preferred material when looking for a good ring that is affordable, which is why the band of this one is crafted with it. It is designed to have two claw of the skeleton phalanges touching one side of the skull while the tail end also touches the other side. It is a perfect combination, and the inside of the band is finished smoothly to avoid any inconvenience for your fingers. With this piece on your finger, you can go all out and take each challenge by the horn. For seasons like Christmas, anniversary, Hanukah or New Year, this could make an excellent gift idea for your loved one. Other Info: It is available from size 7 to 13. This is one ring that is perfectly crafted with a great design. 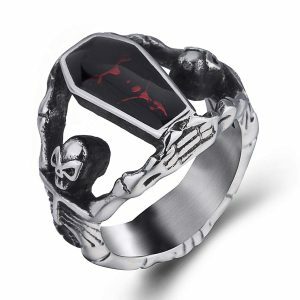 It features the skull in not too elaborate details but still allows you to have the feeling of having the symbol on your finger. The shape, size and color mix of the rings makes it worthy of gracing your jewelry collection. If you are not a man and you are reading this article, then it’s the perfect gift for your partner on any special occasion. 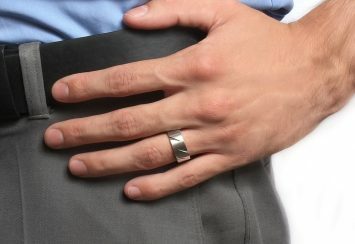 Made with stainless steel, there are a lot of features that make this ring stand out. One of them is the dome blue carbon fiber that was used to inlay the surface of the band. There is also a skull design on the fiber itself to make leave it looking quite dynamic in style. Metal masters are popular for making sure that their products meet the standards and give you something to look forward to wearing. You can bank on the quality of the piece, and it’s comfortable enough to make you not want to take it off. When it comes it finishes, an excellent polishing was done to make the surface glimmer with astute charm. Just order for one and get it delivered to your doorsteps. Other Info: There are different and size for the ring. Stylish designs come in the best of packages, and this is no exception. With a ring that is carved with so much glam, this is one of the best-handcrafted pieces you would find. It has finely detailed that were intricately made to fit the skull symbol and what it stands for. It is crafted using 925 sterling silver which by now has been established as hypoallergenic. The skull is right there carved out of the square front that dominates the band. You will have no trouble falling for the rough black edge that surrounds the skull and the two Celts design also embedded into the sides. Although the price may be a bit on the high side when compared to some of the others in this article, it is worth it. All the materials used are of the highest quality possible, and you can get yours as a custom order. Other Info: The size of the ring varies, and delivery usually deems on the postal service. 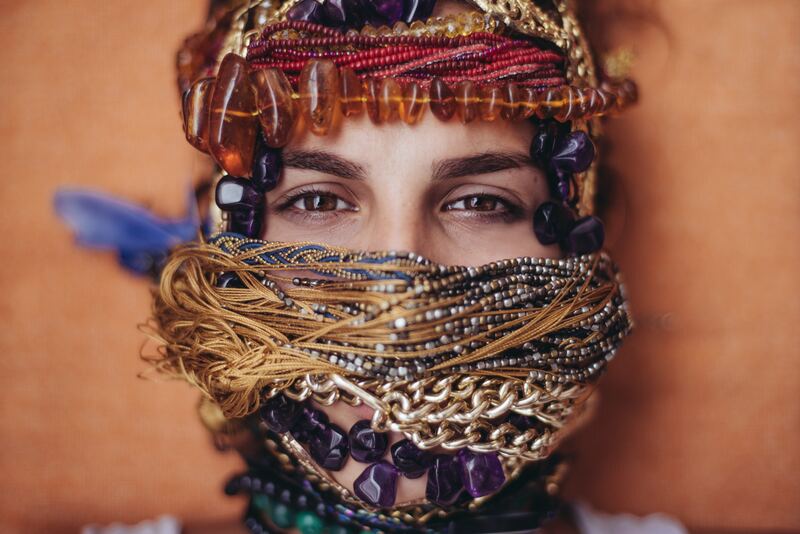 Pauro is among one of the best jewelers in the fashion world. They have products that are affordable without having any compromise in their quality. This ring is from their very best set, and we picked it to make sure we fulfill our promise of giving you only the best. You can pick it up as a gift for someone special or wear it yourself. Crafted with stainless steel, it is plated with silver and gold for aesthetic pleasure. The skull sits at the middle of the band and is pulled by two claw-like shapes carves with the stainless steel. The whole setting is well laid out and the effort immersed into crafting is apparent when you see it. The vintage style infused into the product is an extra that give it an edge over other options. You can wear this one whether you are a biker or not. It also comes in a black velvet pouch for easy storage and gifting. Other Info: It comes in varying sizes. For our final item, we bring you a piece that has the skull infused with a gemstone that makes it look remarkable. With so much to recommend, you will fall in love at first sight of this ring. It has a glimmering look and if you like antique ornament right from your horror movie, then choose this ring. The band was crafted using 316 L stainless steel which is the highest grade of stainless steel possible. Its band is shaped like the whole skeleton with a prominent skull which makes it look super cool. The red enamel part of the ring is gorgeous and is set into the steel shaped like a coffin. Take a look at the image and let it tell you all you need to know about the ring. 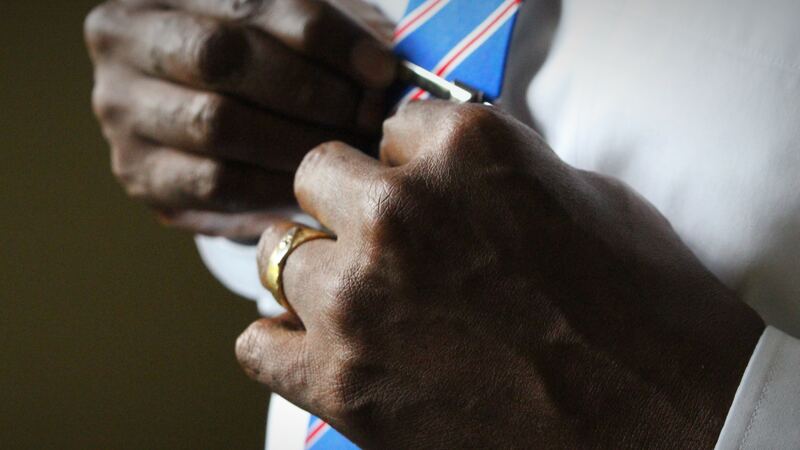 It is also available in different band sizes, and we advise you to measure your finger before ordering for one. For every piece your buy, you get a very nice black velvet pouch which is great for gifting. The price is also affordable. Other Info: You can choose from size 8-14. 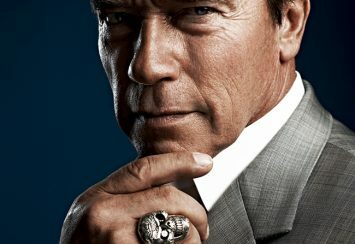 Why Should You go for skull Rings for Men? While women are attracted to beautiful and sparkly jewelry item, men love to have something that makes them stand out without looking too sweet or chic. This is why we think skull rings would be great for you. They are bold and badass, and they are familiar with people who love Goth or emo styling. 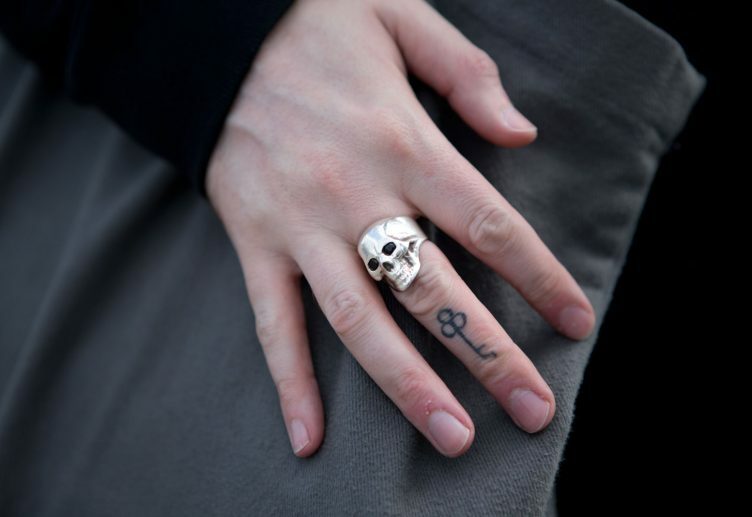 Skull rings are nothing novel, but they have enjoyed a snowballed popularity in recent years. It could be due to the effect of celebrities now wearing them or the fact that it now comes in different designs that are not only alluring but great for any event. Some skepticism still revolves around wearing this type of jewelry, and this is mostly because they are used to symbolize death or warning for danger. Most times skull rings are associated with bike riders, which was a thing in the 7-s. The use of the skull symbol itself dates back to around the 14th century when they would use it as a symbol of victory in war. It started in England but found its way into the far corners of the world. Soon it was seen as a sign of impending mortality and finally death. Famous Venetian painters would usually adopt it in their works, and even writers like Shakespeare used it to bring to life some of his writings. Eventually, the crossbones was added to make it a little more dramatic. However, the skull doesn’t always stand for negative stuff; for example, the Victorian used it as a symbol to celebrate loved ones while Mexico used it for the celebration of life. ✓ Bravery: the skull has always been used to represent bravery. Be it gang men or just your everyday dad. It makes you stand out and reminds you of your resilience to all that life throws at you. In short, one look at your hand and it infuses more masculinity into your demeanor. ✓ Cool and trendy: with the air of freedom they carry and extremely cool material used to craft them. No doubt rocking a skull ring is fantastic. ✓ Equality: death is a great equalizer, and the skull rings remind you that no matter who you are, death is inevitable. If you still think this jewelry are for only notorious sects or cult associates, then you should know monks also wore them. The Tibetan monks usually have one on their fingers to depict the power they carry. So get one for yourself today and use it to complete your masculine look without going through too much stress. This section is significant because skull rings didn’t just become famous for their skull looks or glimmering appearance. They were made famous by our Hollywood stars. 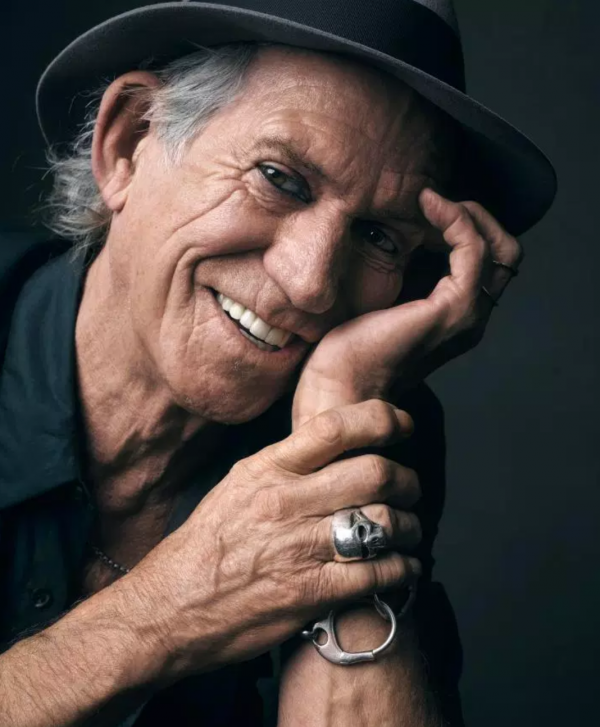 So, if you think rock stars only wear them, here are some of the red carpet favorites that we found with a skull rings right there on their fingers. 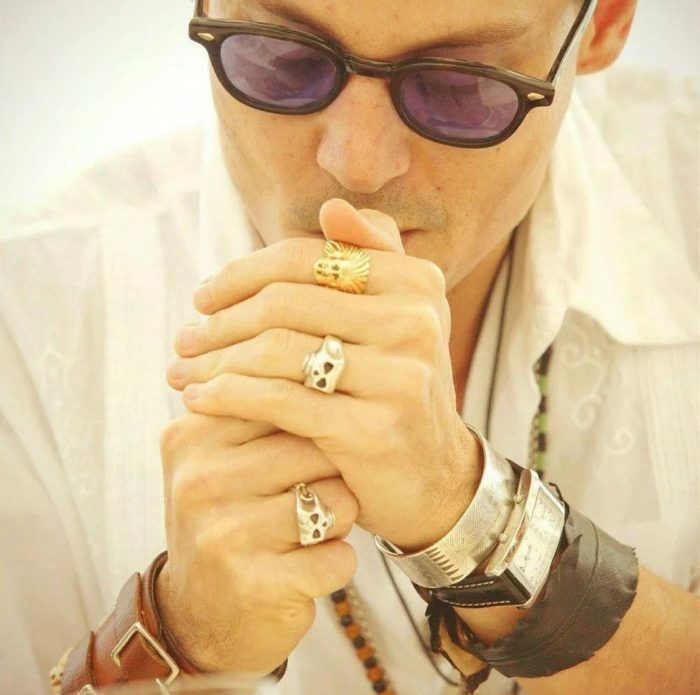 The first person we found is Johnny Depp from ‘Pirates of the Caribbean.’ Along with the movie set, he is a big fan of the skull symbol and even sports one as a tattoo and has another carved into his wedding band. We also found a bold piece on the Sylvester Stallone who is all about the macho bravado. With the toughness and resilience that come with the symbol, we weren’t too shocked. 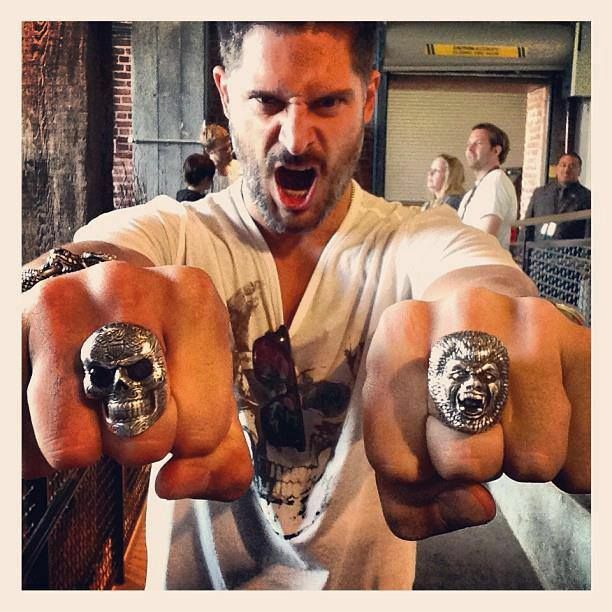 Other celebrities like Joe Manganiello has an obsession with the ring and wears one everywhere. Female stars like Rita Ora and Katy Perry also have a thing for the ring. 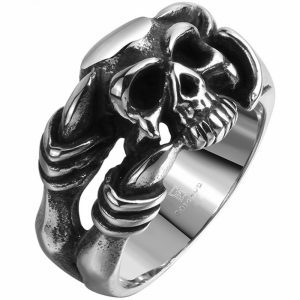 Now seeing that skull rings are stapled and one of the trending items in fashion for men’s category, you want to get one. And we have reached that also covered with ten products from the very finest of brands to make it easy for you to choose. So scroll through and pick the one that best suit you. 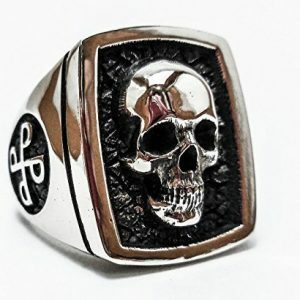 What are the best materials for making skull rings? 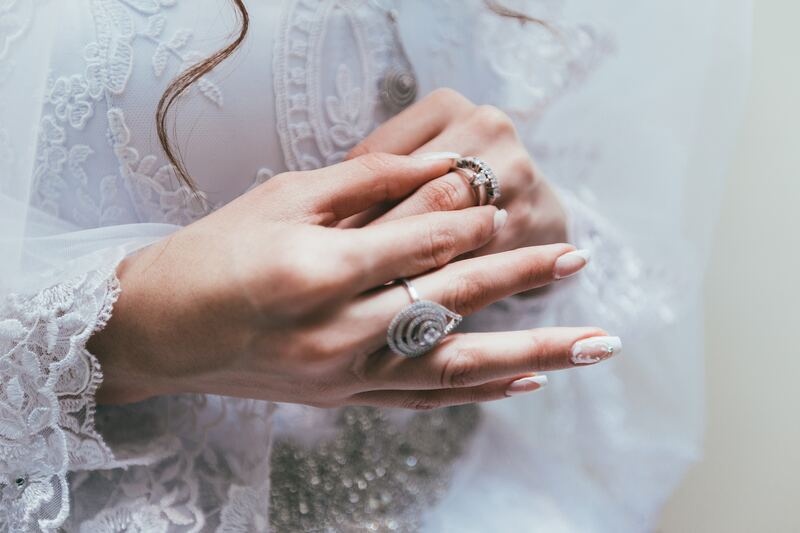 There are expensive materials used for crafting ring and are perfectly healthy for your skin. Pure gold, silver, and diamonds are high, but they are costly and can cost a fortune. But there is still a bright side, with the development of alloys, 925 sterling silver has allowed brands creates jewelry that is hypoallergenic without spending too much. You can also go for a gold plated alloy of greater than 14 kt. Can I wear them to any occasion? The answer is yes, they look good on the hands of celebrities, and the ones we have seen have them on film sets, vacations and even red carpet events. So you can wear it while jogging, taking some days off to the Bahamas or even having that business meeting with your associates. There are also some skull rings that aren’t as big as others, so you can get a simple ring with have a skull shape carved into it. How do I take care of my jewelry piece? This question is crucial because your jewelry would last for a very long time if you pay attention to caring for it properly. Use mild detergent to clean your rings with a soft cloth. Make sure that you don’t scratch it against an abrasive surface or knock it hard against a hard surface. You should also a safe place to keep it whenever you aren’t wearing it.